One week before Election Day, it is clear that the wagons are circled tightly around Davidson Town Hall. The status quo is (and definitely should be) nervous. Early voting totals so far show high enthusiasm in Davidson which is typically not a good thing for incumbents who have supported bad ideas. Town Hall has nobody to blame but themselves for this situation. The decisions made over the past three years have led to this point, a point where every Board meeting, every work session is packed with citizens upset over some agenda item. It is a point that has seen multiple protests on the steps of Town Hall over multiple issues. It is a point where, frankly, things are a little tense. Is it uncomfortable? Yes. Are citizens frustrated? Absolutely. They have good reason to be. Over the past three years Town Hall has put residents through the failed Catalyst Project and the failed Beaty Street RFP. They've pushed through the Rural Area Plan mass rezoning against stiff citizen opposition. The denizens of the current Town Hall have decided to build themselves a new Town Hall without going to the public for the largest spending decision since Mi-Connection a decade ago. Sadly, those are just the "highlights" of the decisions this current group has made. And the response when citizens push back against these decisions? Circle the wagons, double down. With support for Commissioners Anderson and Graham who are seeking reelection being visibly displayed by outgoing Commissioners Cashion and Jenest who are not, it is clear none of these four see much wrong with what has happened over recent years. Commissioner Jim Fuller being the odd man out in this case is a very good thing for him. There is more than a little irony in the circling the wagons strategy this election cycle. 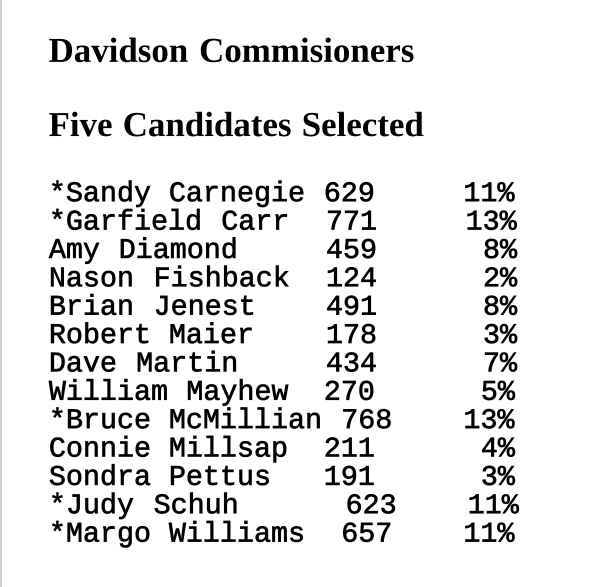 In 2013 there was also a somewhat contentious election here in Davidson. Yours truly was on the ballot that year so the memory of it is pretty clear. Town Hall did the same thing and circled the wagons. Mayor Woods who was running unopposed endorsed only incumbents. The strategy didn't work and two new Commissioners (Anderson and Cashion) made it onto the Board. Sadly, the irony being Anderson and Cashion who successfully bucked that effort are now entrenched in trying to repeat it. Here's hoping the circling the wagons strategy fails - again. To make sure that happens get out and vote for change. Grab a neighbor and get them to vote. 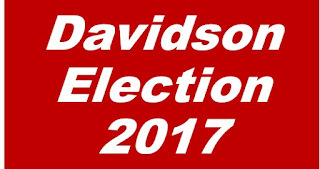 Send an email to your Davidson friends and get them to vote. Post it on your Facebook accounts. Make some phone calls. Get out of your comfort zone and do what you can in the next few days to be the change. Early voting ends Saturday at 1pm. Election Day is November 7th. With enthusiasm high and competitive races in both Cornelius and Davidson, the first weekend of early voting at Cornelius Town Hall saw vote totals way up when compared to recent cycles. Through Sunday 519 ballots had been cast at Cornelius Town Hall. 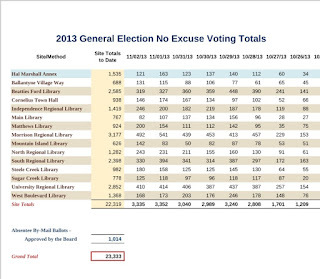 That compares to a paltry 106 in 2015 and 118 in 2013 for the first weekend of early voting. Another way to look at these totals shows much higher enthusiasm at the Cornelius site this cycle when compared to the rest of the county and previous cycles. So far Cornelius Town Hall is the 2nd most popular site out of 17 sites. In 2015 it was the 7th most popular site out of 17 sites. In 2013 it was 9th out of 15 sites. 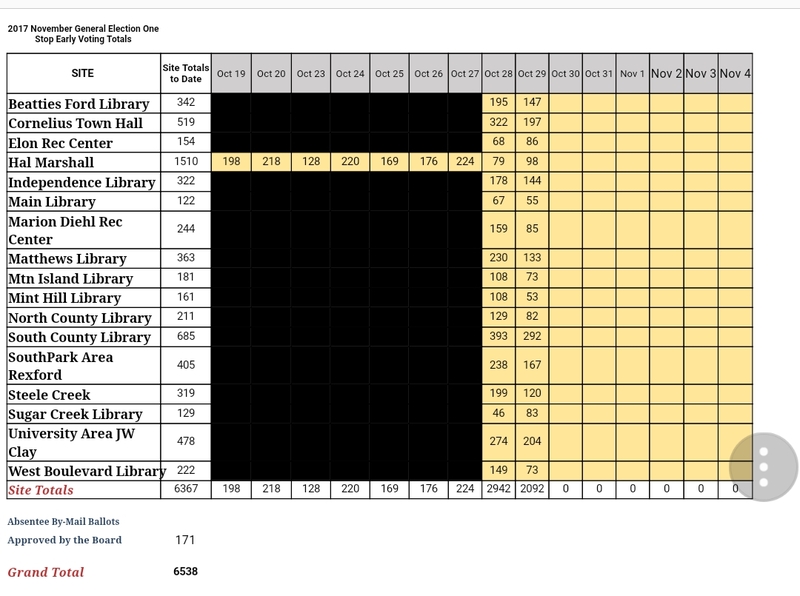 At this point the data on the BOE website doesn't allow for a breakdown of the numbers between Cornelius and Davidson, but this is very likely a good sign for turnout in both towns if this trend holds. Davidson Town Hall is in full swing in support of the $15 million GO bond package on the ballot this election. The bonds were a topic of conversation at last week's Board meeting. There is a piece in the recent Town Message newsletter that went out as well. The Town has even paid for a glossy campaign style mailer to presumably every household in town. What hasn't been mentioned as part of this discussion on Davidson Bonds is the potential use of eminent domain to support any of these projects. Property acquisition is very much part of the overall discussion of the Potts-Sloan-Beaty connector project which will be getting some funding from these bonds. The PSB project will require property acquisition and if landowners/homeowners don't want to sell or want more money, what happens then? Since NCDOT is driving this project eminent domain is certainly an option. One big piece of this project that would receive bond funding is the "Big Wide Sidewalk" (aka multi-use path) the Town wants to put along the PSB route. This will make the PSB connector project intrude on private properties along the way more than it would otherwise. How willing is the town to intrude on private property for a "Big Wide Sidewalk"? Well, the town hasn't "educated" the public on that. At the last Board meeting, there was also a lot of channelling of former Mecklenburg County Commissioner, Parks Helms. When it came to tax increases resulting from things like bonds, Helms was famous for minimizing them. Once he equated them to a chicken salad and a side of slaw. Well, in Davidson, the potential from tax increases from the spending proposals on the table are a LOT more than that. 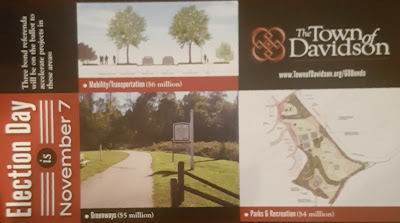 Including these $15 million in bonds plus the planned new Town Hall, Davidson town property tax bills could go up as much as 25% by 2022/2023. That is per the presentation given at the August 8th Board meeting when the Board voted to move both of these spending plans forward. There were multiple points thrown out last Tuesday in attempts to minimize the concern about tax increases such as saying the funds will be used to leverage grants, implying all of the bonds might not be spent even if approved. Commissioner Cashion even equated bonds for long term capital projects to a line of credit. Bonds are long-term debt. Lines of credit are typically used for short-term cash flow needs. They aren't the same thing, but a line of credit may sound better. In the recent Town Message it was even stated that "if increased revenue from growth does not allow for bond repayment, a tax increase may be necessary to cover the cost of repaying these bonds." So you the taxpayer have a choice, the continued accelerated pace of growth or more taxes. Are there some good projects on the list for the proposed bonds? Yes. But until we know exactly what the impacts of these projects will be and exactly who will be making these decisions after election day, voters would be advised to not give this Town Hall $15 million to spend, and those voters should vote "No" on these bonds. The major overarching themes of this election season in Davidson revolve around improved trust and transparency and protecting Davidson's small-town character as well as the needed changes at Davidson Town Hall to best achieve those goals. So, to that end here are aShortChronicle’s picks. For Davidson Mayor, aShortChronicle recommends Rusty Knox. Knox is known, liked, and respected from one end of Davidson to the other and will be the most effective at restoring community trust in Town Hall. He will be an effective leader regardless of the ultimate makeup of the new Board. Importantly, when you think of Davidson and its small-town character, Knox is one of the facets of that character that likely comes to mind. Moreover, Knox has proven his willingness to fight to maintain that small-town character. His founding and leadership of the Paradise Lost group was instrumental in stopping the Catalyst Project that would have damaged Main Street’s character beyond repair. He took the same stance when it came to the recently dropped Beaty Street Luminous project. He spoke out against the mass rezoning of Davidson’s Rural Area, particularly the parts that make major development easier. As a Davidson native, Knox has known many of these landowners for decades and speaking out against this rezoning required political courage. He also supported giving the public the chance to vote on a new Town Hall building rather than the Town unilaterally deciding on that major spending item. That shows he has enough trust in the public to make the right decisions when needed. For all these reasons and more Rusty Knox is the right choice to lead Davidson going forward. This is a change election and with that in mind here are five challenger candidates who are more than capable of doing the job. aShortChronicle believes this mix will provide a diversity of opinion and experience as well as geographic representation across town. Importantly, this group is focused on transparency and a willingness to fight to keep Davidson's small-town character rather than just managing the decline of it. While confident everyone of these people will work for all of Davidson, they are ordered by the rough geographic location of where they live to show that aspect of the group’s diversity. David Sitton – Sitton has been a leader in the fight against the Beaty Street RFP and the Luminous Project. He deserves the credit for spearheading the effort to get an independent appraisal of the Beaty Street property which significantly increased the pressure against the proposal to sell off the town owned property. In conversations with Sitton, it is crystal clear he “gets it” when it comes to the issues of transparency and earnestly involving the citizenry that have plagued Town Hall led projects in recent years. Sam Weaver – Weaver is the youngest candidate on the ballot. “Experience” however is not the only quality in choosing a good Commissioner. Here at aShortChronicle a willingness to ask hard, and at times uncomfortable, questions is highly valued. Weaver has proven his willingness to do that. You can be confident that Weaver will not simply go along with bad ideas and instead will look for ways to stop them, all while doing it politely and with tact. Ryan Fay – Fay’s business experience will be a great addition to the Board. While Davidson is not a Fortune 500 company and should not be managed from the top as if it is, having corporate experience on the Board dealing with large budget issues like Mi-Connection will be very valuable. In conversations with Fay he favored putting the new Town Hall spending up for a vote and more creative thinking rather than the unilateral decision the current Board made to spend millions on a new Town Hall. Fay's statements opposing the Griffith Street Hotel are also right on target. Shana Erber – At a recent event Erber cited the Davidson-Concord Road speed limit fight as well as the Rural Area Plan as the issues motivating her to get more involved in local politics. Those are issues near and dear to our heart here at aShortChronicle. In our opinion that says a lot about the common sense perspective Erber will bring to the Board, and common sense is one of the things that has been sorely missing from the dais at Davidson Town Hall. She has also taken a hard line stance with developers on enforcing the town's planning ordinance. Matthew Fort – Fort will bring a numbers background to the Board that will be very useful. His work experience in corporate divestitures would benefit truly assessing what it takes to get out of Mi-Connection and execute on those plans. Fort has also espoused strong views on openness and transparency and has stated he will donate his commissioner's salary to charity. Those are all things showing he truly understands the meaning of being a citizen servant. aShortChronicle also sees the value of continuity. With that in mind there is one incumbent also recommended for your consideration. Jim Fuller – Fuller has been on the Board since 2011. While he has not always taken the positions advocated by aShortChronicle, he is by far the best of the current Commissioners when it comes to being an advocate of the people. He opposed the Beaty Street Luminous Project. He voted against spending for a new Town Hall without a referendum. He has also asked the hardest questions on the Griffith Street Hotel and long been an advocate for protecting the West Side neighborhood. Fuller regularly talks about Davidson Core Value #5 espousing Davidson’s small-town character. If you want to include one incumbent, Fuller is the one to choose. Now it is time to go vote. Polls open for early voting at Cornelius Town Hall starting Saturday. If you want true change at Town Hall with a focus on openness, transparency, and trust, aShortChronicle recommends filling your ballot and not leaving any of your Commissioner votes uncast as long as they are votes for change. However, in this election with so many candidates running in both the Mayoral and Commissioner races there is the real risk of diluting the vote. With that in mind aShortChronicle strongly recommends concentrating your votes around the candidates listed here. Rarely do voters get the opportunity to fill a ballot and really implement change. Davidson voters have that opportunity this election, so they need to take it. Vote early or vote on election day, but please vote. This election will be a pivotal one in the town's history. Two major road projects that will significantly impact Davidson saw updates from NCDOT and designer Kimley-Horn on Tuesday night. U-5873 (aka Potts/115 Redesign) involves changes to the intersection at Davidson Street, 115 and Potts Street. U-5907 (aka Potts-Sloan-Beaty Connector) involves connecting Potts to Sloan and a roundabout at Sloan/Beaty/Griffith. Town Manager Jamie Justice presented the Potts-Sloan-Beaty Corridor plans. The project vision is to have multiple modes of travel and disperse traffic with another North-South connection through town. Safety enhancements are part of the project, as the PSB is meant to be a “low-speed type corridor”. Justice cited a long history of planning and connections to other projects. He stated that the “process” started in 2011. He cited surveys from 2007, 2014, 2017, but did not state how the surveys were conducted. Justice stated that citizens had input in all of the plans that included the PSB: Town Center Plan (1998), Circulation Plan (2003), Connectivity and Traffic Calming (2004), Station Area Plan (2005), PSB Corridor Land Use Plan (2007), Comprehensive Plan (2010) and Walks and Rolls Active Transportation Plan (2013). Davidson was awarded $2.2 million through I-77 Toll Lane Bonus Allocation for the PSB project and Cornelius was awarded $6 million for the Potts/NC115 intersection redesogn. The two towns are working with NCDOT and Kimley-Horn to complete these projects that have a funding “sunset date” of June 2020 to be under construction. That date is part of the conditions attached to the I77 Bonus Allocation funding. Ben Taylor, Design Consultant for Kimley-Horn, presented the plans and schedule for the two projects. He stated that the project is in the “infant stages” and that the firm wants “feedback because the public knows more about the area than we do.” However, there was no citizen comment period at this meeting. Taylor stressed that the designs are not final, yet emphasized how quickly the project will progress. The Town of Davidson Board of Commissioners will decide their preferred plans next month, November 2017. Taylor stated that the ten foot multi-use path part of the plan involves cutting down the 100-year oak trees and crepe myrtles on Potts Street. There was a question about speed limits on the PSB, with Taylor stating 30 mph and commissioners stating 25 mph. If 30 mph is chosen, there will be a 5 mph increase in the current speed limit on all three affected streets. However, once the project is completed control ofnthe road will revert back to the Town, the Town will have control over setting the speed limit. Taylor admitted that homes, businesses, yards and a school property (The Green School on South Main) will be impacted by the plans. Many citizens learned about the plans for the first time at the October 5th public meeting in Cornelius. Commissioner Jim Fuller asked about these impacts and Taylor suggested residents send him pictures of their affected property. Other concerns addressed included asbestos, burial sites, the stream and wetlands. Taylor stated that “the asbestos will not affect the project” and that “no burials were found in project limits.” On possible burial sites, Taylor said ground penetrating radar had been used to study the area and only a few "anomolies" were found. Those were verified to not be burials. He said all three alternatives at the Potts-Sloan connection will impact a stream and wetland, but it is “permit-able” and “the stream shouldn’t be a driver in this decision” (note that alternative 1, which most impacts the stream/wetlands is the least expensive at $740,000, while the other two alternatives are well over $1 million). If Option 2 or 3 is chosen, Taylor noted that NCDOT will not pay for the homes on the left side of Potts. These Options result in houses ending up with a street both in the front yard and in the back. Commissioner Fuller asked if this negative impact effectively constituted a legal "taking" of these properties, and Scott Cole with NCDOT responded that it most likely did not. Commissioner Graham asked if a cheaper option was chosen would the Town get to use any excess funds elsewhere. The response included saying the costs will most likely go up due to US Army Corps of Engineers’ involvement and asbestos issues. Taylor stated that he was going to “spill the beans” and inform the Town that there is not enough funding for any of the projects. That ultumately could mean additional local funding and/or project scope reduction. With all facets of these projects, Taylor noted that the exact impacts would not be known until detailed surveys were complete. The exact trees that will be removed as well as larger decisions such as the exact positioning of the Sloan-Griffith-Beaty Roundabout could all change somewhat to minimize impacts where possible or to make consteuction easier. Commissioner Beth Cashion expressed concern that citizen written comments were not necessarily included in Taylor’s report, specifically regarding the Potts-Sloan connection. Taylor admitted that he was not the person who compiled the comments (he did not provide who did compile them) and stated that public comments will be available for viewing in ten days. Reduce the roundabout size at Davidson Street/Potts Street/115. Change the trajectory of the new Potts Road to avoid impacting historic homes. Add crosswalks, sidewalks, speed humps, and 20 mph speed limit signs. Prohibit truck traffic. Potts Street was not designed for trucks. Reduce the width of the multi-use path to reduce impact on yards. Change the trajectory of South Main to reduce impact on The Green School and yards. Have only one lane in both roundabouts for safety purposes. Allow citizens time to process these plans and provide public comment. Right-of-Way and Real Estate phases begin in October 2018. Construction begins January 2020. Check this post for pictures of all these options. Content for this post provided by Melissa Atherton of Davidson. Griffith Street Hotel...Who will stand for the children? Tuesday night's Board work session saw another lengthy discussion about the proposed hotel next to the Community School of Davidson on Griffith Street, and to be blunt, for those opposing the hotel for any reason the discussion was not good. 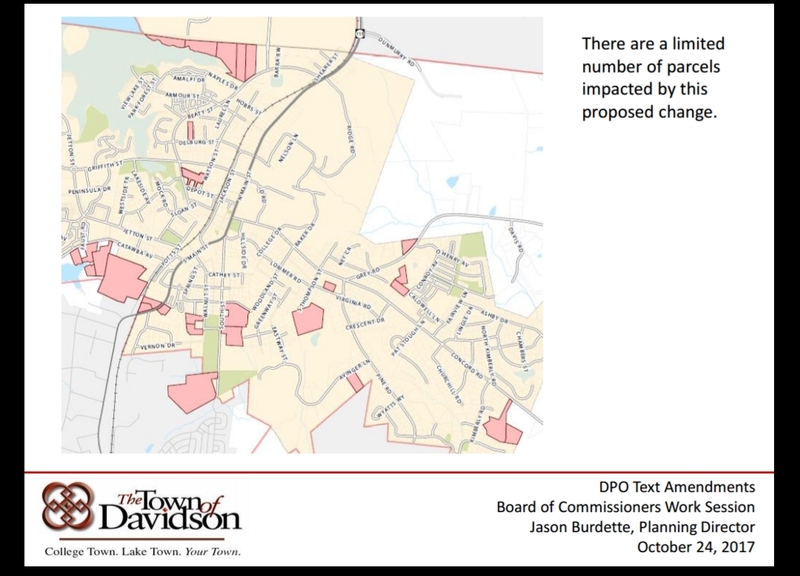 The Board discussed parking, and once again the Planning Staff and the Developer told them it won't be a big deal even though the plan is significantly short of Davidson's standards. The Board discussed at length the tree buffer between the hotel and the West Side paid for by the developer while not mentioning the $20,000 taxpayer gift they passed at the last meeting towards the complementary effort behind Woodies. The Commissioners spent an extensive amount of time picking apart every aspect of the Planning Board's unanimous decision against the project - clearly trying to diminish the Planning Board's effort and provide themselves some political cover if they vote for it. What didn't make the cut to even be discussed? Any aspect of safety due to the location near schools, that's what. After all that has happened with this project it is clear the issue of safety is not even on their radar. It doesn't fit their narrative to even address it, and therefore, it won't be addressed. So, while there is always hope that these officials will do the decent thing, it is getting more difficult to expect. Regardless, hope does not solve problems, people do. To solve this problem will likely require changing the people who are making these decisions in the future. aShortChronicle reached out to two of the new candidates for Commissioner in the upcoming election, Ryan Fay and Sam Weaver. Both of these candidates are on record as opposing the placement of this hotel. They were asked, in the event this project is pushed through by this current Board, would they support the Town helping fund a School Resource Officer for the impacted schools. Huntersville helps support an SRO for Lake Norman Charter, so a similar arrangement seems appropriate here. That's particularly true if the Town takes actions that bring more traffic, congestion, and transient visitors to the doorsteps of multiple schools. "I certainly hope it doesn’t come to this, but we obviously must prepare for every possible outcome. This is a multi-layered question with so many variables, so let me answer as follows. I would absolutely be in support of exploring a resource office to be at CSD and/or Davidson Day. However, to fully support moving forward, we would require a great deal more information. 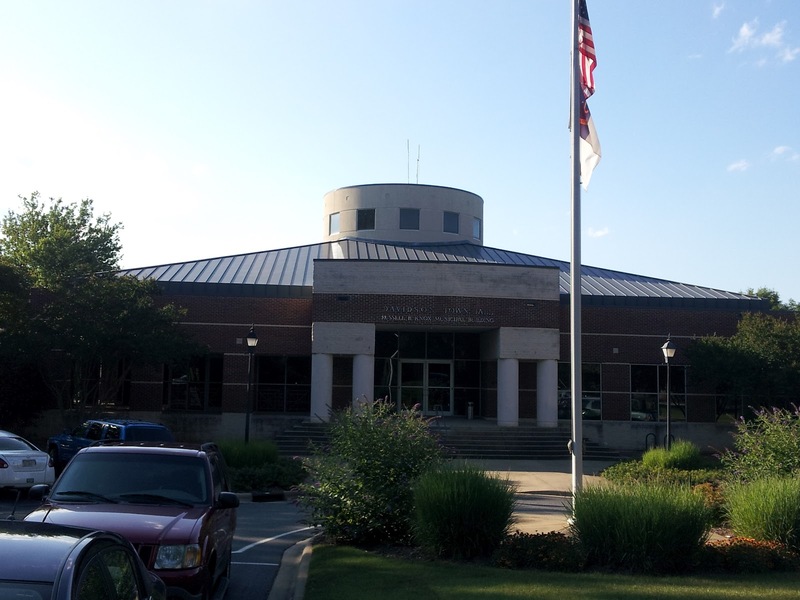 As is my understanding of the current set up with Lake Norman Charter, the resource office is an additional member of the police force who is funded by a combination of Lake Norman Charter funds, a grant from the NC Department of Instruction and the town. It is my understanding that the grants were full but one opened which allowed Huntersville to take advantage of it. This is the kind of outside the current budget thinking that will allow us to stretch our dollars. We would need to determine the availability of the same grant for CSD/Davidson Day. We would also need to determine the funds that would be provided by the school(s). This will help to determine the difference the town would be responsible for. It appears that Huntersville is responsible for roughly $30,000 while the grant ($37,500) and funds from LNC add an additional $40,000. I like the idea of the resource officer (I had one at my public high school and thought he was a solid role model and mentor), and I am support to exploring it further. However, I do not think it is something the town can subsidize completely. I look forward to the Meeting in November and hope this is a bridge we do not need to cross." "If elected or not, I would support and lead that effort to fund a SRO for CSD K-7, Davidson Day, and CSD High School. We could have the officer patrol between the different schools and if needed the patrol officer could respond quickly between the campuses. Additionally, there is an opportunity for the schools to receive federal grants to fund a SRO, but ultimately the Town of Davidson should assist CSD and Davidson Day to help fund the resource." So there you have it. Two newcomer candidates for the upcoming election willing to actually do something to ensure the safety of children as a result of Town decisions. Since the current Board will hardly even talk about safety concerns for this project, these two candidates would certainly be an improvement if the need arises again in the future. Davidson's monthly 4th Tuesday work sessions were chock full of information. The below content provided by Melissa Atherton of Davidson with just slight editing. Stay tuned. More stories to come from this hot-button issue packed meeting. The projects identified in the bond package demonstrate two billion dollars in need. CMS scored every school on a rubric and identified the 29 highest scoring projects. Since 1997, District 1 has opened four new high schools (Hopewell, Vance, Mallard Creek and Hough). District 1 will be addressed in the next round of bonds in four to five years. Other districts have shown support for District 1 in the past. Clark and Wilcox addressed population growth due to rapid development in District 1. In four to five years, CMS plans to provide $15 million to Huntersville Elementary, build a new school to relieve Hough High, build a new elementary school to relieve Blythe, create an addition at Bailey Middle, and invest in Trillium Springs Montessori. Finding land for schools is a challenge, and CMS is interested in land swapping and partnering with Parks and Recreation. An elementary school requires 12-15 acres, middle school requires 35-40 acres and high school requires 58-60 acres. The Rural Area Plan in Davidson will create a great deal of growth and need for schools. Clark encouraged town planners to work with developers and CMS ahead of development. Wilcox stated that solutions to overcrowding include year-round schooling, portables and early lunches. At the 6pm meeting Davidson Commissioners unanimously passed a resolution supporting the CMS bonds. The Cornelius and Huntersville Boards as well as the Lake Norman Chamber have previoisly opposed them. Town Manager Jamie Justice provided information on the bond package. There are three components and citizens can vote to approve or disapprove them individually: $6 million funds mobility, $5 funds greenways, $4 million funds parks. Commissioner Beth Cashion said that the funds are like a “line of credit.” She also added that it would not be the current Board that would spend the money, but future elected officials. Livability Chair, Marty Metzker, provided updates and presented the biggest issue, Section 9 of the Town Ordinance. Update #1) Bailey Springs plans are getting finalized. There are drainage issues. There is a formal bid process in November and the project should be operational in spring 2018. Ipdate #2) This Saturday, 10/28, 10 am to 1 pm, there will be an inauguration for the amphitheater at Roosevelt Wilson Park. Board members, David Cable and Rebecca Chaffin, addressed the need to rework Section 9 of the Planning Ordinance due to complexity. They would like to define the goal of the tree canopy, require good street trees, and update the town commitment to street trees. Jim Garges presented plans for the North Meck Rec Center, one of four in Mecklenburg County. The funds are available as part of the $250 million bond package approved in 2008. The $40+ million recreation center will be built on 40 acres of land at 18121 Old Statesville Road in Cornelius. The 100k+ sqft recreation center is family-focused and for all citizens to enjoy. Features will possibly include: competitive pool, recreation pool, indoor track, basketball courts, senior center, rentable space, arts, cooking, dance, and cultural space. There will be room for outdoor recreation as well. The project will be approved on November 8th and construction will begin as early as Fall 2019. Anticipated opening is Winter 2021. There are three Davidson Livability Board members advising the North Meck Rec Center project. At the 4pm work session today a text amendment involving "changes" to high density development types will be discussed, and it is getting the attention of those who live in town. Apartments in front of the Swimming Hole on Lorimer? How about more them behind? How about more 10-20 unit buildings spread a throughout in-town neighborhoods? Check out the below map. All of the pink properties are up for discussion on something the planners are calling the "missing middle". That's planner jargon for building types between single family and super high density multi-family. This discussion was sparked due to the concern around the high density projects proposed for the village area, and you can bet the Town will attempt to take credit for this proposed change as lowering density from some of the current zoning. That would be a stretch, a big stretch, because these new zoning changes still allow for up to 20 unit buildings. However, it is election season and elected officials take credit for all sorts of things if they think it can get them votes. And...before you get your hopes up that this might stop something like the massive Potts Street development, don't get too excited. That project whose property is depicted on the map was submitted before this change and any subsequent changes to zoning rules would not apply to it. The discussion on this will be at today's 4pm work session. "The common thread is protecting the public interest in the fairness and integrity of land-use decisions. Public confidence in government depends on the integrity of its decisions, and the avoidance of bias and conflicts of interest in these various forms is no doubt a factor in establishing that confidence." That is from the 1997 piece "Bias and Conflicts of Interest in Land-Use Management Decisions" by Professor David Owens with the UNC School of Government. Professor Owens is the long-time faculty land use and zoning expert at the institution. That idea of fairness and unbiased decision making is particularly important because of how land use decisions impact the lives of citizens. In the conclusion of the article Owens describes the importance this way. "Governmental land-use decisions have a profound effect on communities and individuals. It is through these decisions that the quality and character of our state's future development will in large part be determined. These decisions also can significantly affect individual landowner's rights. It therefore is imperative that these decisions be made in a fair and impartial manner." Impartiality is clearly of utmost importance in conditional zonings where ultimately it is up to the Board of Commissioners to decide on just about every detail. Commissioners are effectively like the judge and jury in a trial. 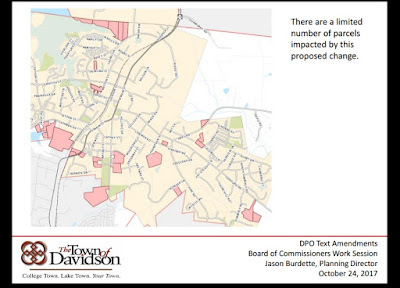 However aShortChronicle recently obtained an example where impartiality in conditional zoning questions may not always have been the case here in Davidson. Prior to the current Griffith Street hotel controversy, the most recent conditional zoning donnybrook in Davidson was the 2015 Narrow Passage development. aShortChronicle recently obtained an email from a public records request showing Commissioner Stacey Anderson forwarding a citizen's email to the attorney for the Narrow Passage developer during the height of the debate. The citizen who had emailed the Town was strongly opposed to the Board granting the variances requested by the development team. This occurred in May of 2015. Ultimately, when Narrow Passage was unanimously approved in August of that same year, it was Anderson who made the motion for the approval. To be fair, when the citizen sent the email of concerns to the Town, the now defunct DavidsonNews.net was copied, so that would indicate there wasn't a concern about confidentiality. However, aShortChronicle was curious why a sitting Commissioner would proactively send off an email opposing a development to the development team. After looking at numerous records requests over the years, this kind of thing certainly isn't common. Anderson responded last Friday with the following. "I don’t remember this particular email, it was almost 2 and a half years ago. I think that is important for elected officials to recognize that constitutional rights and transparency should benefit all property owners, not just a select group whether they for or against development, and I am glad I made an effort to share those citizen concerns at that time with the applicant. Elected officials don’t get to choose who gets constitutional rights and who doesn’t." This response from Anderson of course ignores the fact that nobody's constitutional rights are infringed if a Commissioner doesn't proactively send this type of "helpful" email. A developer has every right to request public records just like anyone else if they want this information. Nor does it explain why all emails on a subject aren't sent to all parties in these types of decisions. If there was a legitimate concern about constitutional rights, there would probably be a law on the books requiring they be sent or easily made available to any interested party. Instead, this looks exactly like what Anderson says Commissioners should not do - deciding who gets something and who doesn't. It is this kind of flawed thinking, and not just from Commissioner Anderson but from this entire Town Hall administration, that has led to too many justifications of bad behaviour and wrong decisions. For a comparison, aShortChronicle checked in with candidate Matthew Fort to get his take on sending that kind of email Commissioner Anderson is "glad" she sent. We asked Fort on this specific example because he sites Narrow Passage as the reason he got involved in local politics. Here's what he had to say. "As a commissioner, I will make an effort to avoid forwarding a citizen’s e-mails to developers or their legal representation without their permission. If there is a need to pass information onto a developer, I would prefer to have that be done through the town staff. That being said, if a developer or their representative asked me a question, I would certainly respond but also make sure to include town staff on my response. I had a phone call with a citizen who walked me through their concerns regarding the Potts/Sloan/Beaty corridor. I listened to their concerns and then asked if it was ok to use their name in my e-mail to the town staff. After I sent the e-mail to the Town Manager, I forwarded my note to that citizen to keep them informed. Upon receiving a response from the Town Manager, I then forwarded that response to the citizen as well." So why bring up this situation now? Well, as mentioned at the beginning, the Griffith Street Hotel proposal currently sits before the Board. It may get voted on at the November 14th meeting - one week after the election, and if this happens, Anderson will get to vote on this conditional proposal even if she is not reelected. However, if it is not voted on by a lame duck Board, whoever is on the Board after that will get to decide. When choosing your candidates this election season remember there is one incumbent candidate who doesn't seem to "get it" when it comes to handing these types of sensitive issues and at least one challenger candidate who does. Davidson's Board meets on Tuesday, and there is a lot on the agenda. At the 4pm work session, Commissioners will here about the CMS bonds. North Mecklenburg is getting very little out of this mega round of school bonds. The Lake Norman Chamber, Cornelius, and Huntersville have given their official thumbs down on this package. At the 6pm work session there will be multiple updates on controversial projects. Commissioners will hear an update on the Potts-Sloan-Beaty Connector. See here for the presentation. The presentation appears to be an explanation of how the Town got to this point. It does not appear to be covering the equally controversial piece of work at the south end of Potts Street at the intersection with NC115 which is being treated as a separate project by NCDOT. To be honest the presentation reads like the standard update that comes from Town Hall once people know what a project is actually going to mean. It is the update where the Town says "we've been planning this for years, so concerns are a bit too late. Sorry. You should have been paying more attention all along." The second controversial project on the docket Tuesday evening is another update on the Griffith Street hotel. It looks like there is new set of parking plans and an updated landscaping plan. See here for the documents. Readers will remember that the vote on this conditional use was postponed from the October 10th meeting supposedly due to the developer requesting more time for its landscaping plan. What wasn't mentioned until it was a surprise addition to the agenda at the last meeting was a $20,000 budget amendment by the Town to also add buffer behind Woodies. The Town had been trying to get the Hotel developer to take care of the Woodies buffer as a condition of approval for its project. However, that $20,000 taxpayer funded budget amendment is looking more and more like a concession to the developer than the other way around. This is the last Board meeting prior to the election, and it doesn't appear anything has changed with how this administration approaches issues. 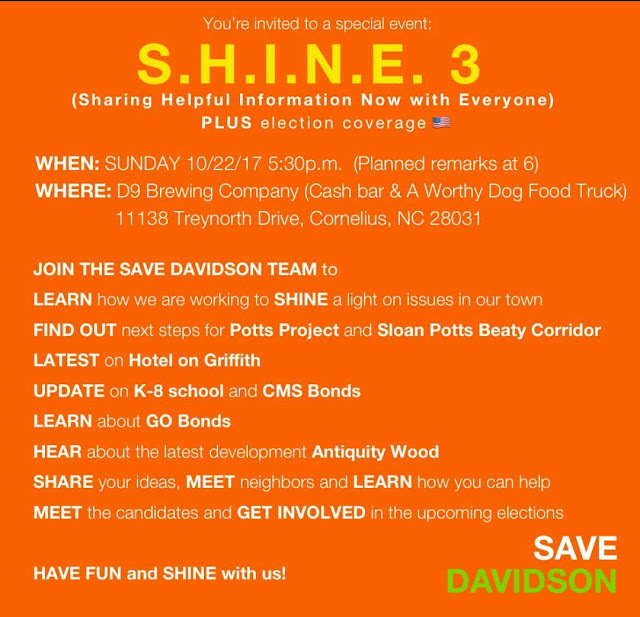 If you've missed the first two SHINE events put on by Save Davidson, you have a chance to get in on the next one Sunday evening at the D9 Brewery. SHINE, or Sharing Helpful Information Now w/ Everyone, is an opportunity to meet with fellow activists and take communication that often occurs on social media into the real world. Here are the topics that will be covered. While the all important municipal elections this cycle are sucking up all the oxygen, let's not forget that Davidson voters will also be deciding on the town's first ever General Obligation (GO) Bonds when they go to the polls. 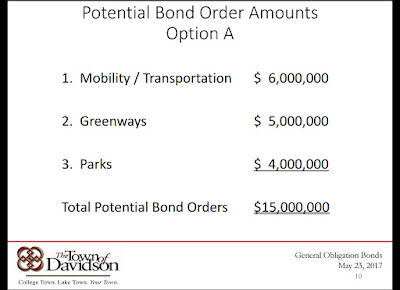 These bonds total $15 million in new spending divided into three separate ballot questions. 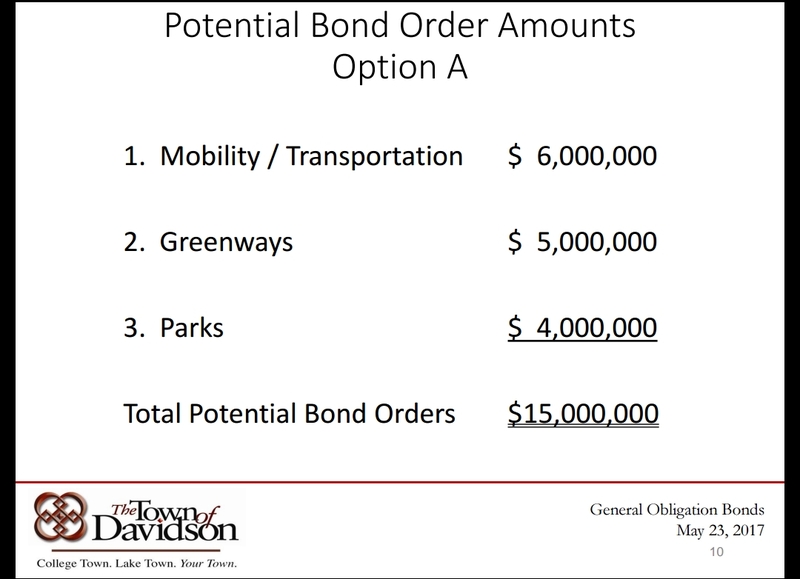 Important to note, these Davidson Bonds are separate from the CMS Bonds that are also on the ballot. The Davidson bonds are divided into the below categories. These bonds, if passed, would likely be issued on the proposed schedule below. So, should you the voter vote yes or no on this spending? Here at aShortChronicle the answer to that question is a resounding "NO"!!! The reason for that answer is simple, take a look at the dates in the second picture. The first of these bonds aren't planned to be issued until 2019. A big part of the reason for that is answered by how Davidson is planning to pay for these bonds as well as the new Town Hall. Davidson is planning to use the money from the 2019 property revaluation to raise everyone's tax bill by 25% to pay for all of these projects. There is no reason to approve these bonds in 2017 if they aren't even scheduled to be spent until 2019 and beyond. All of these decisions are linked together and voters need to treat them as such. This election is primarily about restoring trust in Davidson Town Hall. Under this Board and Town Administration trust has been falling fast due to this group's flawed decision making. However, until the election day results are known, one has to assume some or maybe all incumbents will be re-elected. People can and should work hard to ensure at least a new majority is put on the Board. If that doesn't happen though, do you want to give this current group $15 million of your money to play with? Why on earth would anyone vote to give this Davidson Town Hall more money to spend when they have proven they can not be trusted with the responsibility they already have? The good news is this. Voting "no" in 2017 does not mean any worthy projects on this list won't get built and in most cases they might not even be delayed. If a new Board is elected on November 7th that you trust, the new Board can put Bonds back on the Ballot in 2018. At worst, some of the 2019 projects might be delayed a bit. That would also provide the opportunity for the citizens to have some real input into what projects are funded. So, to be very, very clear, this recommendation is not about opposing spending on parks or greenways or other things voters may want. This is about first ensuring Davidson elects people who can be trusted to spend the money wisely on those things based on the people decide. So, get ready to head to the polls and vote for a new set of elected officials but vote against the Davidson Bonds. I-77 Mobility Partners and Sugar Creek Construction have issued a traffic advisory and detour maps to educate motorists about upcoming traffic shifts and overnight detours on I-77 at Exit 30. Work will occur overnight from Thursday, October 19 from 11:00 p.m. to 5:00 a.m. through Friday, October 20 from 10:00 p.m. to 9:00 a.m., weather permitting. Work will continue for the next two weeks (through November 3) at night from 11:00 p.m. to 5:00 a.m. Please proceed with caution during this construction process. With early voting set to begin at Cornelius Town Hall on Saturday October 28th, it is now officially crunch time in election season and Davidson saw some serious action on Tuesday. Save Davidson made two major announcements. The first announcement brieflt floated on the group's Facebook page was its formation as a 501c(4) non-profit. This designation with the IRS alows the group to operate as a tax exempt organization. However, donations are not tax deductable. 501(c)4 groups are called "social wellfare" organizations intended to promote certain social causes. Unlike 501(c)3 groups however, this designation allows political activity in support of promoting the group's social wellfare goals. Save Davidson recommends the following candidates. For Commissioner: David Sitton, Matthew Fort, Shana Erber. There are five town board seats. Save Davidson is recommending that citizens vote for Sitton, Fort and Erber and then pick two additional people from the following list: Autumn Michael, Jim Fuller and Ryan Fay. With the Save Davidson group boasting a large membership this kind of recommendation in a field with a large number of candidates could certainly be a game changer. In other election news on Tuesday, that large field got a bit smaller. Commissioner candidate George Berger announced on his campaign Facebook page he was going to "suspend" his campaign and would not be attending any more candidate forums. Berger cited the time commitment and recent discussion that made him realize he could best serve the town in other ways. At this late date however, Berger's name will still appear on the ballot as it is too late to have it removed. Things are really getting interesting now as this election season heads into the final turn towards the finish line. Is NewsOfDavidson.org an extension of Davidson Town Hall? The NewsOfDavidson.org website has been up and running for a month now, and readers have gotten a taste for the type of fare it will be serving up. So far, readers have have been treated to numerous columns covering non-profit activities and various lifestyle pieces on living in Davidson. Those have been interesting and useful. That type of content is also to be expected since the organization was originally conceived around being a clearinghouse for non-profits to get their various messages out to the public. As for "news", things have been relatively limited, but then again that's also not surprising. As what looks like a one-person operation on the "news" side at NewsOfDavidson.org, getting out stories is a challenge - believe me aShortChronicle knows that as well as anyone. the town and residents in a way that provides transparency into Town operations, and as importantly, provide the context around these things so people know what they really mean. 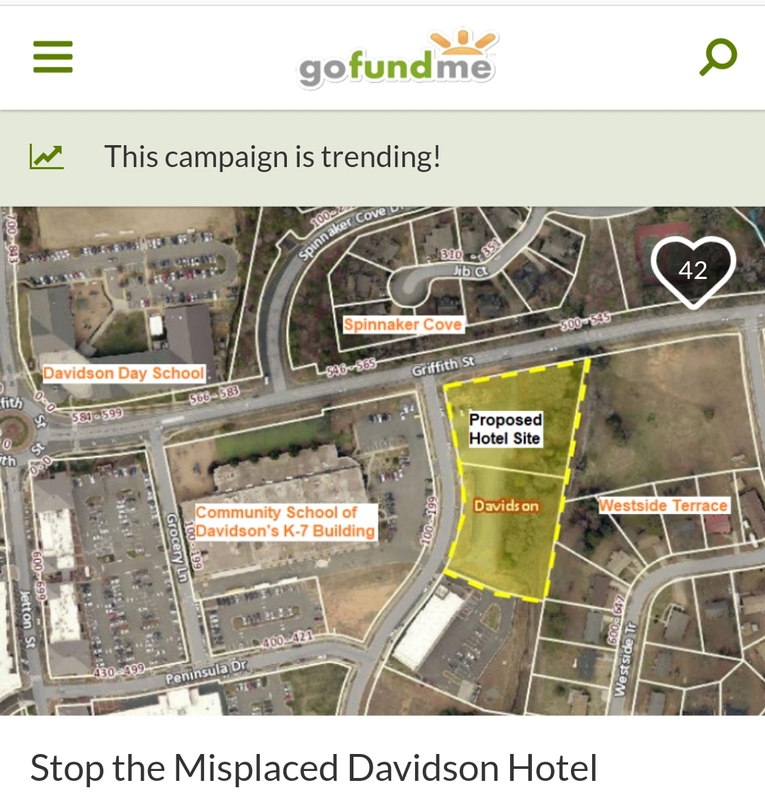 After reviewing the site's initial content as well as a lengthy public records request with numerous references to how this site came into existence, there are a number of concerns that lead one to believe NewsOfDavidson.org very well may just end up effectively being an extension of the Town Hall Public Information Office rather than an organization willing to actually cover and challenge Town Hall. First, let's take a look at the obvious. The Board of NewsofDavidson.org which is a 501c(3) organization includes a Commissioner candidate this election cycle (Jane Campbell), two former Davidson Commissioners (Connie Wessner and Margo Williams) plus a former Davidson Finance Director (Cindy Jones). Jones is now listed as the contact for the 501c(3) after it was originally set up by Campbell. There are also a number of other Board members who are well tied into the Town over a number of years. Active citizen participation in these types of organizations is awsome and it is one of the things that makes Davidson, well...Davidson. News and media on the other hand hold a special place in our society. One of the primary responsibilities of media is to hold our elected officials accountable. With a Board makeup like that, does anyone really believe this new "news" organization will include hard hitting pieces, records requests, and deep diving research on controversial topics involving or supported by Town Hall? Common sense says "no, it will not". Take for example these two stories from NewsOfDavidson and aShortChronicle on the recent NCDOT meeting around the controversial Potts Street Corridor projects. See here for the NewsOfDavidson story and here for the one from aShortChronicle. The first says essentially NCDOT held a meeting. Town Hall supports these projects. Some residents don't like it. The end. The one from aShortChronicle provides a lot more detail about what questions were asked what was answered and what the specific concerns expressed by citizens actually were. Interestingly, the story from aShortChronicle was written by another citizen activist. One example does not make a pattern, but as a 501c(3) non-profit NewsOfDavidson will also have a difficult time covering hard hitting stories related to politics in general. People need to remember that one of the biggest forms of bias is actually bias by omission. Meaning, stories that are lightly covered or not covered at all actually are a form of bias in and of itself. When it come to NewsOfDavidson being a 501c(3) bias by omission is almost built into its operating model due to the constraints of its non-profit status. Certainly, some people probably think aShortChronicle has shown bias as well over the years and to be honest, with over 800 stories on the blog it probably has happened. Human beings are human, and here we believe all people are biased - even real journalists. As a lowly blogger and not a "real journalist" aShortChronicle thinks we're just more honest about admitting it. However, all of that is just the obvious stuff. As mentioned at the top of this post, aShortChronicle reviewed dozens of emails from a public records request showing the close ties between Davidson Town Hall and NewsOfDavidson.org going back to it's very beginnings. Public records show, NewsOfDavidson.org, or NOD, got its start immediately after DavidsonNews.net shut down operations in May 2015. In fact, in less than a weekend after DNN announced it was ceasing publication, major movers and shakers in town were working to revitalize it. Campbell put together the notice pictured in this piece that was placed on the DNN site. Based on the public record, from the outset it is safe to say Campbell and Mayor Woods together were the driving force behind trying to revive DNN or find a replacement. Much of this information is only available now due to Mayor Woods using his official Town of Davidson email in the initial coordination effort. However, one of the earliest emails for coordinating a response after DNN announced it was ceasing operations also included Town Public Information Officer, Christina Shaul, and Economic Development Director, Kim Flemming. In the initial planning, it was discussed how to possibly raise donations to subsidize existing operations of DavidsonNews.net. This would have been considerably expensive, and that idea quickly seems to have been cast aside. However, in an email between Campbell and Woods in late July 2015, Mayor Woods says he is being encouraged by "some" to have the town possibly buy out the DNN url. To her credit Campbell responds to Woods saying "I don't think the town should do anything. It would be a conflict of interest - for the same reason you are stepping back from our proposed organizational structure." There are numerous other examples throughout the public records showing NOD regularly using Town facilities as its meeting space including the Board room. The Town apparently allows this for non-profits. That is not necessarily a bad thing as long as the Town is equally as accommodating to all non-profits. These meetings were largely coordinated by Campbell including at least one example after filing for office this summer, again according to the public record. As the NewsOfDavidson was getting its 501c(3) designation, it asked if the Town was willing to provide a letter in support of its application for non-profit status. Mayor Woods replied enthusiastically that the Town would be glad to do that. A letter was put together by attorney's helping the group and provided to Mayor Woods to sign on behalf of the Town in late January of 2016. The letter specifically says NewsOfDavidson will "lessen the Town of Davidson’s governing burden related to community building and engagement of and civic education for our Town’s citizens." Again, not a bad thing when promoting Concerts on the Green or Christmas in Davidson, but not necessarily a good thing when covering Board meetings where politically contentious issues are discussed. Covering all of these things are mentioned in the letter as well. 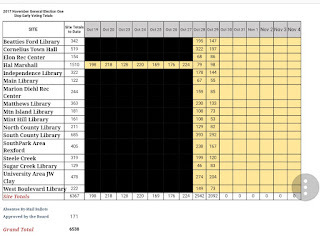 Finally, throughout the public records information there are numerous requests for updates on the status of the NOD roll out. Those requests come from both the Public Information Officer to pass along to elected officials and from Mayor Woods himself. The Town was kept apprised of the roll out every step along the way. That is a lot of interest by the Town in a website. It would seem obvious that if Campbell is successful in her bid for Town Commissioner she would have to completely step away from NOD as a director. Her own comment to Woods about a conflict of interest would certainly apply. However, the real question is this. "When it comes to the likelihood of NewsOfDavidson really covering Town Hall, with so many other entanglements would removing just this one really even matter?" The newly renamed municipally owned cable operation formerly known as Mi-Connection now doing business as Continuum faces a number of challenges. The recently announced re-branding of the operation to the Continuum name and the new marketing campaign that doubles down on the hyper-local nature of the company won't immediately solve the revenue problems, and subsidies will continue to be needed for years to come. Competition will continue to grow as new players enter the market - including wireless providers who may eventually leapfrog the idea of even needing a wired connection to the home. The emerging idea of "cord cutting" will also become more and more of an issue as well. This last one - "cord cutting" - made industry-wide news this week as powerhouse AT&T posted numbers saying it had lost 390,000 net subscribers in just the 3rd quarter with the losses ascribed to cord cutting, or the decision to forgo the traditional cable subscription in favor of so called Over the Top (OTT) services such as Netflix, Playstation Vue, or SlingTV. See this article from Hollywood Reporter for more on that announcement and how it affected stocks of the large competitors. What started a few years ago as a bit of a novelty has now gone mainstream. This new article from CordCuttersNews.com shows that those ditching traditional cable may have reached 1 million in a single quarter in the 3rd quarter of 2017. aShortChronicle HQ ditched cable and phone a couple years ago and can confirm for you it is doable and certainly can be less expensive depending on your TV habits. So, what does all this mean for a company like Mi-Connection/Continuum? Not much if you listen to the comments that have come from Town Hall in recent years. You'll likely hear something like "the company doesn't make much money on TV anyway. Data is where it's at in the future." While that may be true, it ignores the fact that pure data access is quickly becoming a commodity. As data becomes a commodity with more providers able to provide a comparable service, subscribers will be able to switch from provider to provider based on who has the lowest price. If they get their content via OTT services they won't have to deal with new set-top boxes and user interfaces. This will increase what's called "churn" between providers. Churn is a costly thing for providers to deal with just to maintain revenue as is, much less grow it. Mi-Connection's FY2017 numbers were flat compared to FY2016. If cord cutting and churn were factors in that, the company isn't saying in its press releases like AT&T. However, if this industry trend is impacting the biggest of players, it will very likely make its way into the equation in the long march towards profitability for Mi-Connection/Continuum. Something to keep your eyes on in future information from Town Hall. 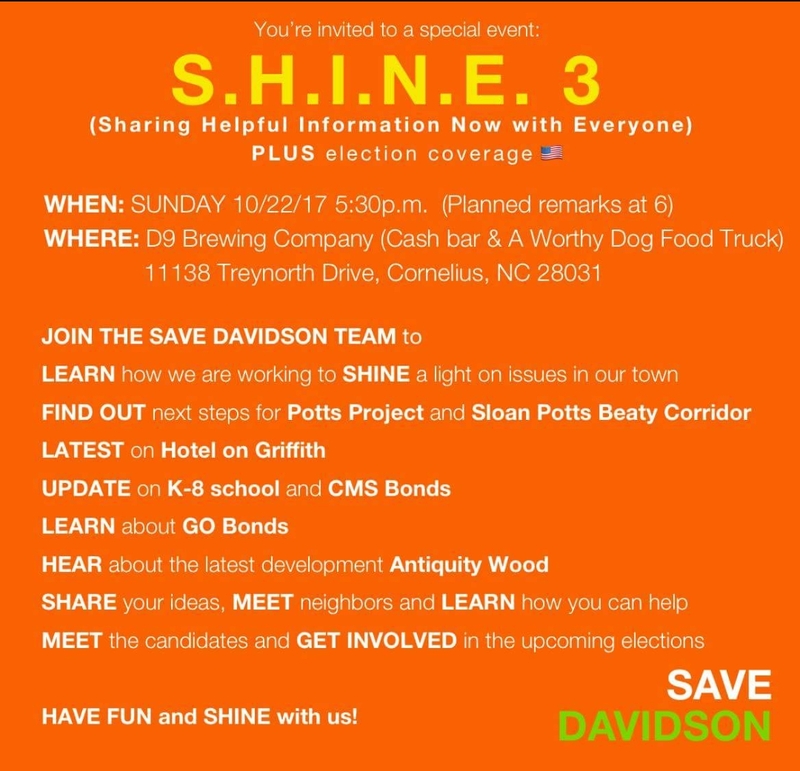 As mentioned in Part 1 of this topic, Davidson's elections are setting up to be the most interesting in North Mecklenburg. On the Commissioners race that is definitely a true statement. Like the mayoral contests, historically, these haven't been very raucous affairs. However, the large number of candidates is not unprecedented. 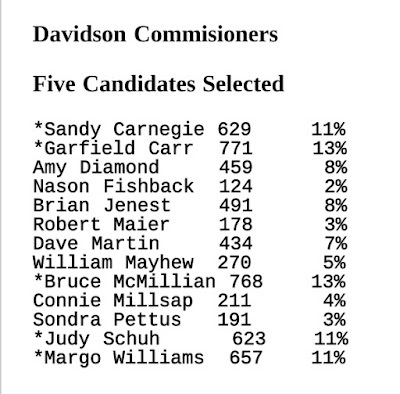 Going all the way back to 1995, Davidson had an election with 13 Commissioner candidates, just like this year. 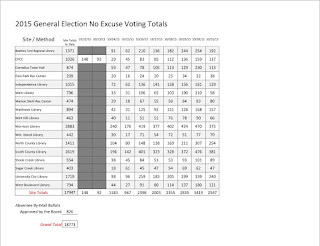 Below are the results from the Board of Elections for that race. While all 5 of Davidson's Commissioners are up for election at the same time, "open seats" created when incumbents decide not to run again tend to drive large numbers of candidates. Since incumbents are always hard to beat, open seats ensure at least that many newcomers will get elected. That has happened this year, and that same dynamic happened in 1995. In that year two sitting Commissioners on the 1993 Board decided not to run again in 1995, opening up two seats to challengers. Interestingly, one of those 1995 open seats was created by Commissioner Randall Kincaid deciding to challenge then Mayor Russell Knox, current Mayoral Candidate Rusty Knox's father. Kincaid lost to the elder Knox that year, but was elected Mayor unopposed the very next cycle in 1997 when Russell Knox retired from office. The second interesting thing about the 1995 Commissioner results is the small percentage of overall votes cast that it took to get elected, just 11-13%. How is that possible? The low percentage of votes required is due to the structure of this type of plurality election. In a plurality election voters get one voter for each seat up for election, or in Davidson's case - 5 votes. The top 5 vote getters are elected. When you have a large number of candidates, those votes get spread across a larger number of people thus causing the winners to receive a lower percentage of overall votes. Obviously, the town's population has grown since 1995, so the overall number of votes cast this election will be higher. However, seeing a similar vote share for the winning candidates this year would not be all that surprising. So what does all that history mean for how voters can strategically cast their ballots this year? Many readers may remember this 2015 piece about "supercharging" your vote by actually withholding some of your 5 available votes. Withholding votes in a plurality election mathematically gives more weight to the ones you do cast as a percentage of the overall votes cast in the election by all voters. While that logic and the math behind it still holds true this cycle, the large number of candidates this time does not necessarily require it to achieve one's electoral goals - depending on what those goals are. Here are a two scenarios at opposite ends of the spectrum this election cycle. If you truly only have one candidate you really, really want to see get elected, then bullet voting would still apply. That is where you vote for a single candidate and leave the other 4 votes uncast. This strategy is often used to support minority candidates to get enough votes in a voting block to bring that candidate into the top tier. In a plurality election with a large number of candidates where the winners will receive a small overall vote share, this could be particularly effective. If you want a true change in direction at Town Hall for more transparency and accountability to the public, the number of challengers this cycle allows you to pick a full slate of new elected officials for the Board, so withholding votes to achieve this goal is not necessary. The purpose of withholding votes (or voting for less than five) is to ensure you don't just give a vote to someone you really don't want on the Board which could put them ahead of someone you do want. Due to the number of candidates this time, you can vote a full slate of 5 without having to give any votes to incumbents if that's what you want to do. The questions voters should ask themselves this cycle are these. Do I agree with the direction the status quo is taking the town and is a given candidate a part of the status quo? To determine the answers look at issues such as The Catalyst Project, Beaty Street RFP, allowing voters to decide on spending on new Town Hall, support for the Rural Area Plan mass rezoning, and support for controversial projects such as the Griffith Street hotel or the Potts Street development. You should also look at how they've handled the I77 HOT lanes project. Incumbents running this time have some role in all of the above list of issues. Of the incumbents, Jim Fuller has the most voter friendly record on these issues. He voted against new Town Hall spending without voter approval. He voted against sending the Beaty Street RFP to the contract phase before it failed. He is asking the hardest questions on the Griffith Street Hotel. However, on an issue like the I77 HOT lanes, none of the sitting Davidson Commissioners would be described as strong anti-toll leaders. Davidson has passed by far the weakest anti-toll resolutions over the years, and none of the sitting Commissioners sought to censure Mayor Woods when he went to Raleigh and advocated for the tolls against the Town's stated position. When looking at the challengers, they tend to fall into two groups. Candidates who have been in the orbit of Town Hall for years and true newcomers. Your choices here would seem to be options of filling the void with people who have long been "in the know" with Town Hall but less than willing to aggressively fight its bad ideas or selecting newcomers to the political arena who will approach challenges with a fresh perspective. Regardless, this election with its large number of candidates provides Davidson voters with the rare opportunity of having real choices, and how voters choose to strategically cast their ballots will determine the outcome. In Davidson, the dynamics this election season are quite different this time around, so here's some updated thinking on this topic. It will be in two parts. Part 1 covers Davidson's mayoral contest. Davidson's mayoral race is setting up to be the most interesting contest North Mecklenburg has seen in over two decades. Mayoral contests are often not even contests. Instead, Mayoral candidates often run unopposed as is the case in Cornelius and Huntersville this year. Races with three or more candidates are rare and competitive races with more than two candidates are rarer still. According to data available from the Mecklenburg Board of Elections, since 1995 there have only been a few races in North Mecklenburg towns with three or more mayoral candidates. Only one of those would be deemed truly competitive. That would be the 2007 race for Huntersville Mayor. See results below. Jill Swain won this race with less than 50% of the vote. That's the only time that has happened locally in any of the towns in at least two decades. In all of the other races with three or more candidates, the winner got at least 50%. In Davidson this year, the likelihood of a similar scenario to that 2007 Huntersville race is high with three candidates having bases of support and good name recognition. John Woods, Rusty Knox, and Laurie Venzon will very likely all get a substantial percentage of votes. 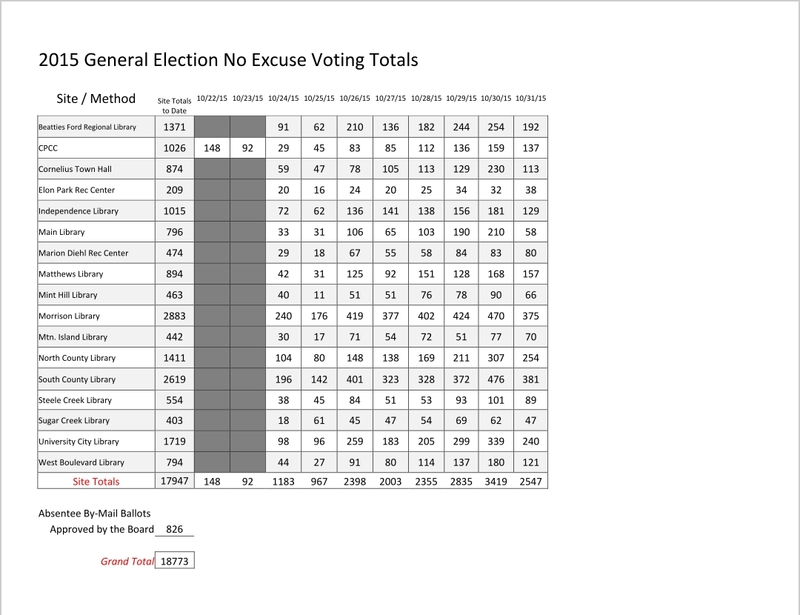 If Woods was to win re-election it almost certainly would be with less than 50% of the vote with the "Not Woods" vote being a majority but split between Knox and Venzon. As was pointed out in this piece, in the 2015 vote where Woods was unopposed, a substantial percentage of voters did not pull the lever for him even when he was the only name on the ballot. 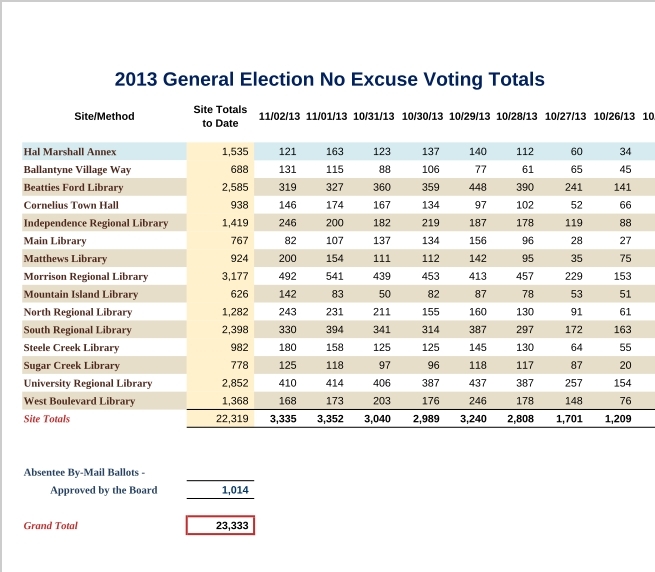 More than 27% of voters that cycle left the Mayor's race blank or wrote in other names. That does not bode well for him getting a majority of votes while facing serious opposition. However, in a three way contest it also doesn't mean he will lose as was shown by the 2007 example in Huntersville. So, how does Woods lose re-election? He loses if the "Not Woods" vote coalesces around one of the two challengers. This certainly can happen, but if it doesn't, Woods very well may win. What can cause this coalescing to happen? In the opinion of aShortChronicle this can only happen around the candidate most prepared to address the town's top problem when it comes to Town Hall, and that problem is "trust". A lack of trust permeates nearly every issue originating from Town Hall whether those be legacy Mi-Connection problems or the myriad planning issues roiling the public in more recent years. If people do not implicitly trust the Town's top elected official, getting them to trust ideas out of Town Hall will be nearly impossible. So when looking for a choice for Mayor, look for the candidate who can best resolve the issue of trust. Who is the candidate who has visible and obvious support from one end of town to the other? That candidate will have the best shot at unifying the town. Who is the candidate who has visibly fought the bad ideas out of Town Hall in recent years such as The Catalyst Project, Rural Area Plan mass rezoning, Beaty Street RFP, not letting voters have a say on major spending for a new Town Hall building, and the ill conceived Town Hall supported Griffith Street Hotel and Potts Street projects? That candidate will have proven they are willing to fight against bad ideas and for what the people of this town want. Answer those questions honestly, and you will know who to vote for this election. Signs, signs, everywhere signs....in Davidson?!? !